We have had extensive involvement in the Avenham Estate in Preston. A troubled estate in the past, Avenham had the worst reputation in Preston. It originally included seven tower blocks (two were sold to the private sector in the early 1990s) and associated low rise and medium rise properties. By the mid 1990s, the estate was suffering from severe demand problems and associated problems of crime and anti-social behaviour. Steve Sharples wrote the 'Changing Avenham' strategy for Collingwood Housing Association (now Contour), to transform the estate and also (with PCA) the successful £9.5million Estate Renewal Challenge Fund bid, which provided the resources to implement the strategy. This was a combination of high-rise refurbishment and low-rise demolition and new build. The strategy also involved developing intensive area-based housing management systems and a comprehensive resident involvement structure, which PSC subsequently developed for the new landlord, AvenQuest Homes. Upon completion of the Stock Transfer from the Council to Collingwood’s subsidiary, AvenQuest Homes, we were asked to carry out an in depth demand study on the estate. This led to a decision to demolish two of the five tower blocks. The work transformed what had been the least popular of Preston’s 92 estates into a high demand, stable estate with a strong local community. As part of our Demand Study for AvenQuest, we also examined the prospects for the three remaining tower blocks in Council Ownership in the Moor Lane area of Preston. 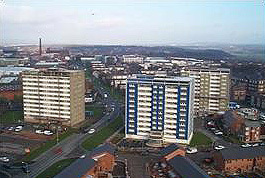 Our study, and the Council’s associated stock condition work, was instrumental in the decision to demolish these blocks in 2001.